The 1st Access Challenge was a charrette organized by the IwB as part of the Millennium Scholarship Fund, in partnership with George Brown College, the YMCA, and the Canadian Post-Secondary Access Partnership. 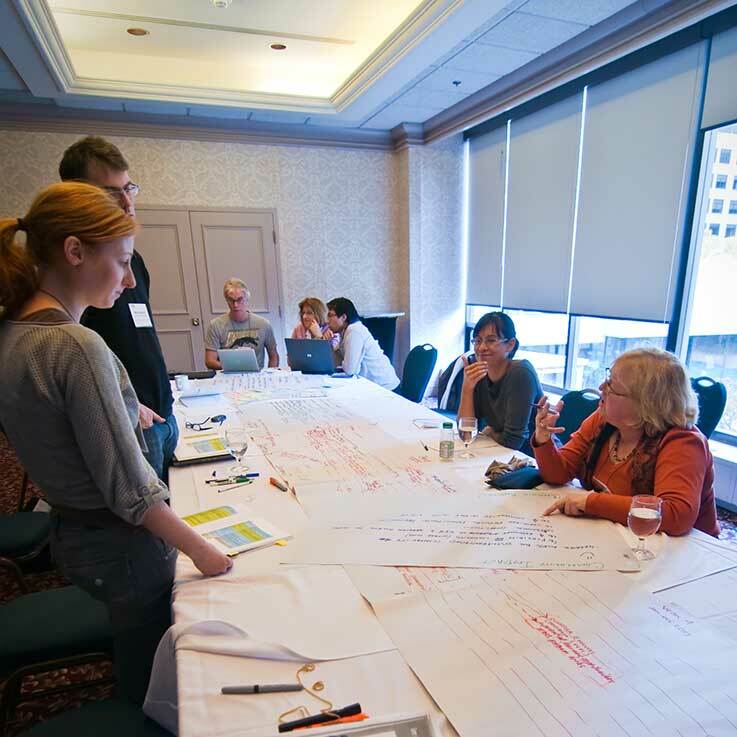 The charrette brought together local and international participants and experts to tackle issues around access to postsecondary education in Canada. The charrette was held over 3 days, from October 24-26, 2009, at the IwB and at the Sheraton Hotel in Toronto. It looked at 11 communities across Canada: Biggar (SK), Concordia/ Lower North Shore (QC), Hamilton (ON), the Mi’kmaq Communities of Nova Scotia, Nanaimo/ Vancouver Island (BC), Saint John (NB), Prince George (BC), St. Catherines (ON), St. James Town in Toronto (ON), St. John’s (NL), and Surrey (BC). Promoting equal access to postsecondary education in Canada is task of vital importance. Community representatives were organized into charrette teams and were given the task of brainstorming solutions to improve access to postsecondary education in their communities. The teams, supported by charrette facilitators and creative professionals, were asked to propose an idea that targets groups and barriers in the community, then show how this plan would work, and what impact it might have. The charrette results were structured to be action plans for each community. They also contributed to a national resource document that was made available after the charrette to other Canadian communities working towards increasing postsecondary access. The Canadian economy is in transition. With previous manufacturing areas changing to new types of economies, the need for new skilled, educated workers is great. Over two-thirds of jobs today require some level of higher education, yet many Canadians do not pursue postsecondary education. Whether because of career indecision, social pressure, lack of information about opportunities or due to financial constraints, many Canadians face barriers to postsecondary education. The 1st Access Challenge Charrette was conducted to facilitate this aim as part of the Canadian Post-Secondary Access Partnership, an initiative of the Millennium Scholarship Foundation. 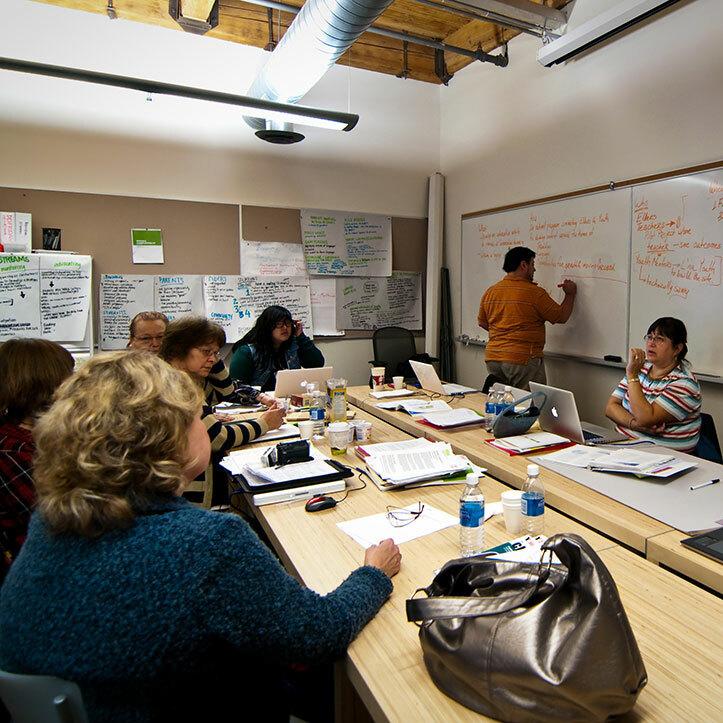 The IwB worked with the 11 chosen communities and the Canadian Post-Secondary Access Partnership representatives to build the capacity of the community organizations to provide aid and consultation services, technological tools, training, and professional development opportunities to youth and adults. Each charrette team received a Community Challenge Brief that included a short community profile, objectives for the charrette, information about their team members, and relevant research specific to their unique community barriers and opportunities. In addition to the specific community research summaries, included in each brief, was a general overview of the state of postsecondary access in Canada as well as reference and source information about existing programs and tools. The overarching goal of the charrette was to empower individuals to reach beyond their imagination and to learn about the many benefits of postsecondary education. The charrette teams looked at many broad categories of barriers to postsecondary education and how these barriers can be manifested both at the individual level and at the community level. These include but are not limited to: academic, cognitive, cultural, economic, ethnic, financial, gender-based, generational, geographic, linguistic, physical, psychological, social, and technological barriers. Discussed at the charrette were new programs and partnerships between postsecondary institutions, government, and industry that create market-driven learning opportunities and simultaneously have wide access. Other main topics of discussion included: the role of technology in providing access to areas that were once considered too remote and in a wider range of languages than was possible in the past, the focus on the learner within the context of his or her community, and the importance of familial and peer support, cultural biases, and linguistic barriers to learning. The 11 charrette teams each proposed new programs, partnerships, and design tools that can work in their specific communities. Summaries of the communities profiles and links to proposals are below. Nestled in the heart of the Canadian Prairies, Biggar is located within 100 kilometers of two of Saskatchewan’s largest cities, Saskatoon and North Battleford. While the residents are proud of their community, they also recognize the challenges in maintaining and improving the quality of life in a changing economy. Biggar has been working to develop programs to combat diverse issues, including generational cycles of poverty and to instil a desire to continue education in its youth. Click here to view the Biggar Team Presentation. The team from Concordia had the challenge of providing postsecondary education to populations that are too remote to be physically accessed. Geographically, this region can only be reached by plane, boat, or skidoo. There are no roads running between towns. The communities of the Lower North Shore, with a population of 8,000, face tremendous barriers to access both geographically and physically. Further, the Lower North Shore is an anomaly in Quebec because its population is approximately 90% Anglophone. Thus, language is an issue with regard to employment, healthcare, and education. Concordia is looking to deliver to the communities of Quebec’s Lower North Shore via local Community Learning Centres (CLCs). The CLCs are the result of an initiative by the Ministry of Education in Quebec. The intent is to increase the viability and vibrancy of these Anglophone communities. As a part of their approach to delivering content, video conferencing infrastructure has been established, thus making it possible to connect with these communities through technology. Click here to view the Concordia Team Presentation. As a result of closures and major reductions in manufacturing industries, a major sector of the Hamilton economy has all but disappeared. The largest employers in Hamilton are now its hospitals. Skilled trades are required in this region, but, as in most of Canada, it is difficult to entice young people into these programs. The region is dealing with a rapidly shrinking population of skilled trades workers and trades training often takes a back seat to more traditional academic types of study when secondary school students and their parents consider choices for post-secondary education. The goal of the Hamilton Charrette team was to examine ways to build a skilled workforce to service Hamilton and to contribute to and improve the overall health of the community. Click here to view the Hamilton Team Presentation. There are 13 Mi’kmaq Communities scattered throughout Nova Scotia, ranging in size from about 4,000 people to only 300. These First Nations tend to have diverse needs in the area of education. While some communities have on-reserve primary, elementary and secondary schools, others send students off-reserve into the public school system. These communities now control primary, elementary, secondary and postsecondary education programs with the support and guidance of the Mi’kmaw Kina’matnewey (MK) Education organization. There are many barriers to education for the Mi’kmaq people of Nova Scotia. 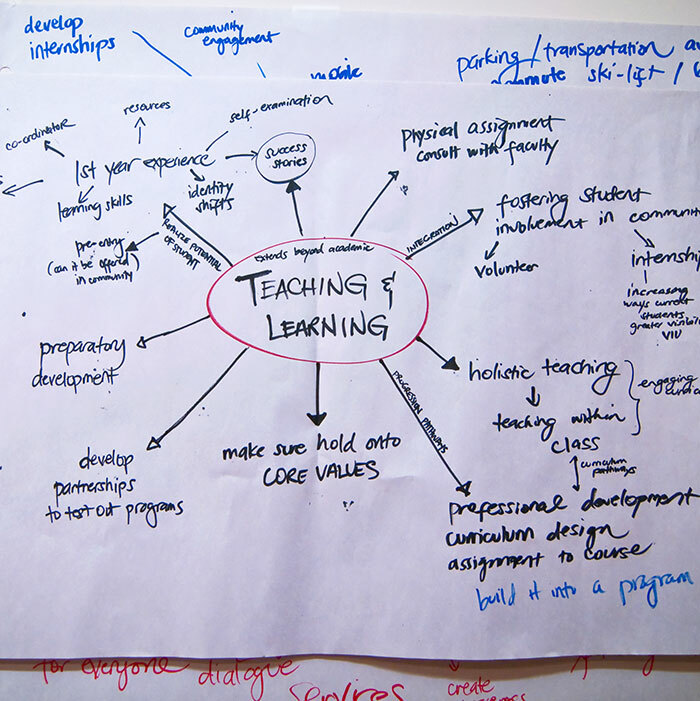 The challenges include identifying a number of community based capacity driven practices and assets that will contribute to a comprehensive essential lifelong learning strategy for Mi’kmaq people. The team from Nova Scotia aimed to further explore and expand on the opportunities that are included in all current projects and programs in Nova Scotia; namely life skills, essential lifelong learning, individual professional development, and university access and career development across all ages and disciplines. Click here to view the Mi’kmaq Communities Team Presentation. In the Nanaimo area there are extremely low high school completion rates and low participation rates among recent high school graduates choosing postsecondary education. A significant number of high school students have parents who did not proceed to postsecondary education, or perhaps did not even complete high school. The charrette team from Nanaimo was looking to hone strategies and tactics to improve completion rates among high school students, to improve participation rates of high school graduates moving on to postsecondary education and training, and to work towards improvements in funding to support students faculty and staff. Click here to view the Nanaimo/ Vancouver Island Team Presentation. Prince George has a population of over 70,000, it is the largest city in Northern British Columbia. As a major connecting town for the Province’s North and South highways, Prince George plays a vital role in the economy and future of the province, as well as guides development and investment across the North. The economy of Prince George was once dominated by the forest industry and is now witnessing a shift toward service-based occupations. In this shift, many resource workers have lost gainful employment and the community has been faced with some of the lowest rates of high school completion in British Columbia; the disparity between job availability and job readiness is growing. Against this backdrop of change, the group from Prince George was looking to involve youth, especially from a number of the region’s Aboriginal communities, in new mentorship, advocacy and community engagement programs. Click here to view the Prince George team Presentation. Saint John is a city of neighbourhoods, whose residents closely identify with their particular area. While this identification can be a source of great pride, in the case of post secondary attainment, it can act as a double-edged sword. Without peer or family example or support, residents can easily get caught in a cycle of poverty. Breaking the poverty cycle in Saint John is a community priority and local leaders from business, government and community are driving a poverty reduction strategy in Saint John that involves thousands of community members. Adding to the necessity of developing post secondary attainment strategies is the fact that the province of New Brunswick has one of the oldest workforces in Canada. The aging workforce, historical out-migration, and reactive investment in post secondary institutions combined with global competition for skilled and professional workers is making it increasingly difficult for local employers to fill vacancies. There are existing programs in the community that provide a strong foundation for access to postsecondary programs. The challenge for the Saint John team was to find ways to leverage these programs while identifying and addressing disparities. Click here to view the Saint John Team Presentation. The Niagara region is experiencing exponential job loss within the manufacturing sector. Due to the disappearance or downsizing of several large employers in the region, municipalities are being forced to look at new and diverse opportunities to prevent an exodus of well-trained workers. The hospitality and tourism (including the wine industry) remain strong sectors in the regions economy and there has been a strong shift towards Niagara becoming a region of entrepreneurs, with a 25% increase of residents reporting self-income from 2001–2006. Both Niagara College and Brock University have committed to work with local communities to provide both outreach and opportunities for local partnerships. Furthermore, they are committed to provide curricula and training to meet the changing needs of the regional job market. Click here to view the Niagara Team Presentation. St. James Town is an inner city Toronto neighborhood consisting of approximately 17,000 people living in primarily subsidized housing. Many residents are well educated with professional experience not recognized in Canada. Most must go back to school, start another profession or increase knowledge and skills already learned in their country of origin. This upgrading can be both emotionally and financially taxing. Consequently, there are many low income/ high achiever kids who have very poor parents. The community is rife with youth for whom post-secondary education does not seem like a possibility. One of the community programs, Youth Build, takes disenfranchised youth and gives them the skills to participate in the green economy. Other projects for youth in this neighbourhood include pre-apprenticeship and dual-credit programs. But concerns remain that there is not enough communication with the youth. The St. James Town charrette group was looking to build bridges between high school, college, and work. Click here to view the St. James Town Team Presentation. St. John’s is a small, vibrant community located at the eastern edge of Newfoundland. Its strength in terms of postsecondary access is that there are a large number of community based organizations who are working diligently at improving access to postsecondary education for low income individuals, Aboriginals, new Canadians and other groups with barriers. On the whole, there is a decline of rural populations in the province of Newfoundland and Labrador. St. John’s is experiencing a high level of in-migration from small communities, but also experiences a high level of out-migration, particularly educated people, who leave for increased employment opportunities elsewhere in Canada. The St. John’s charrette group was looking to engage the community in increasing access to postsecondary education for underrepresented groups. Click here to view St.John’s Team Presentation. The City of Surrey has taken initiatives to increase postsecondary participation rates through programs and organizations in its communities. Actually increasing rates of literacy, however, has been a significant challenge. According to Literacy BC approximatley 40% of adults in the area do not have basic the literacy skills to function a in the modern economy. In the City of Surrey, 52.5% of the population over the age of fifteen does not have postsecondary education. The essential skillset is limited for many people in the community, as the workforce now requires more than high school graduation. In response to this trend, SPARK (Students, Preparation, Access, Reaching goals and Knowledge) Education Program, in partnership with SPARK Foundation (a group of local businesses), Surrey School District, Kwantlen Polytechnic University, and the BC Government, launched a new initiative targeting students who face barriers to higher education. While Surrey does have many resources, the challenge lies in increasing access to these resources in the community at large. In order to increase education participation at both high school and postsecondary levels, there needs to be an action plan regarding the distribution of resource information. Click here to view the Surrey Team Presentation.